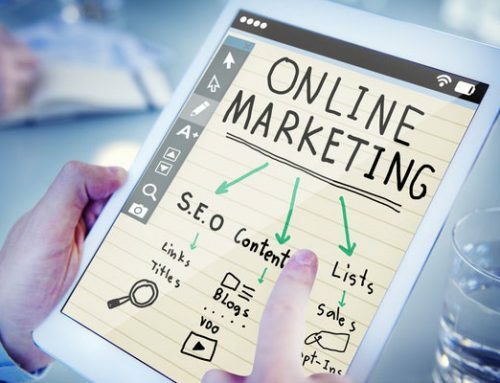 Local SEO or Local Search Engine Optimization is a marketing strategy that helps businesses promote their products and services to local customers. A Local SEO strategy includes SEO optimization, local content, directory listings and local links. 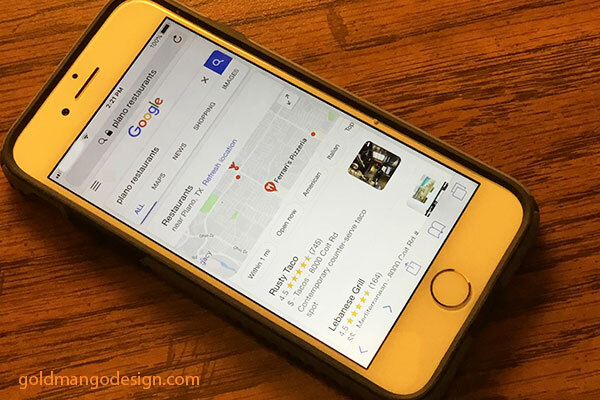 This helps your business rank high in the organic search results and the “Google Local Pack” when local customers search online with keywords relevant to your business. Why do I Need Local SEO for My Website? If you are a local business that serves customers in your local area, optimizing your website for local SEO is very important. Local SEO optimization will enable your website to rank in the top pages of Google search results for online searches near your location. It will enable local customers to find you when they search online for products and services near them. Here are some statistics that show how important Local SEO is for a local business. 4 out of 5 customers use search engines to search for local information including store address, hours, directions and product availability. 50% of people who did a local search on a smartphone, and 34% of those who searched on a computer, visited a store in one day. 18% of local searches led to a purchase within 1 day. 500% growth in “Near Me” mobile searches that include terms “can I buy” or “to buy” over the last 2 years. Who Will Benefit from Local SEO? 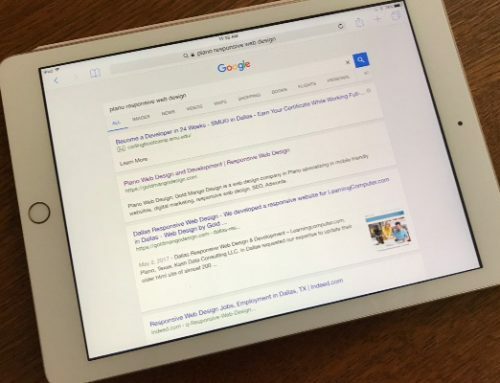 Local SEO can benefit many local businesses including doctors, dentists, lawyers, restaurants, hotels, realtors, plumbers, handymen, electricians and retail stores. When you do an online search for a local business on Google, you will get a list of local search results that feature different sections. On the top of the list may be some paid search ads followed by a map and the “Local Pack”. 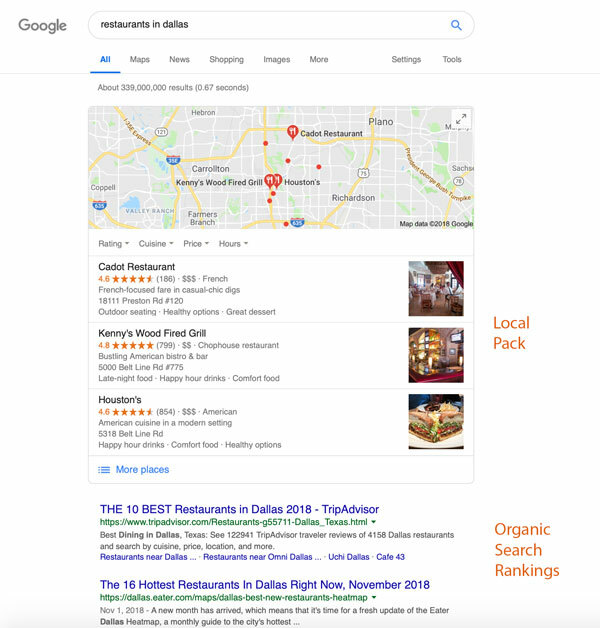 The “Local Pack” is a listing of 3 local businesses that Google has chosen based on proximity to the searcher’s location and search relevance. Businesses that are listed on the “Local Pack” get a lot of additional visibility and attract a lot of click-throughs to their website. Below the “Local Pack” are the organic SEO search results. These are the organic search results that Google has selected to be featured on page 1 based on different search ranking factors. The “Local Pack” provides additional information that is not available on the organic SEO results. This information could include reviews, ratings, hours and customer comments. With effective SEO optimization of your website, your business should aim to be listed on both the “local pack” as well as the organic SEO rankings for your products and services. It is estimated that the local pack may get as much as 33% of the total clicks on the page. View the image of the Google local search results below with the “Local Pack”. Local SEO optimization includes several factors including Google My Business listings, local citations, on-page SEO optimization, links, reviews and more. Here are 10 Local SEO Tips to help your business boost local search rankings and reach local customers in your local area. Getting your business listed on Google My Business is very important to improve your local SEO rankings. Its free and you get a lot of exposure if you get listed as one of the top listings on the Google Local pack. Google search listings use Google My Business listings for both the Local Pack as well as for organic rankings. Make sure your business Name, Address, Phone Number (NAP) and URL are correctly listed. Select the correct business category for your business which describes what your business does. Provide a good business description. Add plenty of images of your products, services, staff, customers and location. This is an important step. Make sure you verify your listing. Google will send you a post card with a PIN to verify your listing. 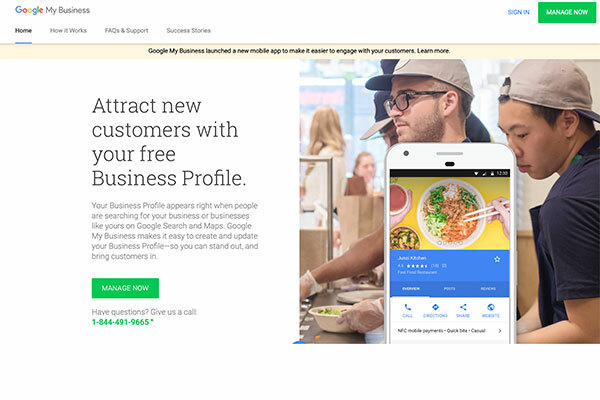 You have to enter the PIN on your Google My Business account to verify your business before it will be listed. Bing is the second largest search engine after Google. Getting your business listed on Bing is also a local SEO ranking signal. A majority of customers search online for local products and services. It is important to get your business listed on online directory listings or citations. Make sure your business Name, Address and Phone Number (NAP) are consistent across all directory listings. In additional to getting listed on Google My Business and Bing, you should get listed on other online directories. This includes Apple Maps, Yellowpages, Yelp, Foursquare, Yahoo LocalWorks, TripAdvisor, and others. Claim social listings on social media sites like Facebook, Twitter, LinkedIn and Instagram. There are data aggregation sites that provide business listings to online directories. These include Neustar Localeze, InfoUSA, Acxiom and Factual. You can list on some of these sites directly. Websites such as Brightlocal.com and Moz.com provide business listing services to get your business listed on multiple directories. Don’t forget to get your business listed on your local chamber of commerce, local business associations and local newspapers. Depending on your industry, you can also get listed on industry-specific directories such as Tripadvisor.com, findlaw.com, healthgrades.com, houzz.com and homeadvisor.com. Mobile devices are the primary devices used by consumers to make online search queries and access websites. A Pew Research Center survey conducted in January 2017 found that 77% of Americans use smartphones, and 95% of Americans own a cell phone of some kind. A mobile friendly website is essential for your local SEO strategy. A mobile-friendly website is essential for a business to reach mobile users and increase leads and conversions. In addition to being mobile friendly, your website must also be designed with Responsive Web Design. A website that is Responsive will scale in size and change its format to fit the size of the mobile phone, laptop, tablet or desktop that the customer is using to browse your website. In addition to being mobile-friendly and responsive, your website must load fast. Most websites today lose more than 50% of their visitors because they take too long to load. That’s a significant number of lost customers and sales. To ensure that your website loads fast, keep all images small and optimized. There are several other ways to increase web page speed. A web developer can help you with this. SEO or Search Engine Optimization is a marketing strategy of optimizing a website to improve its search engine rankings. 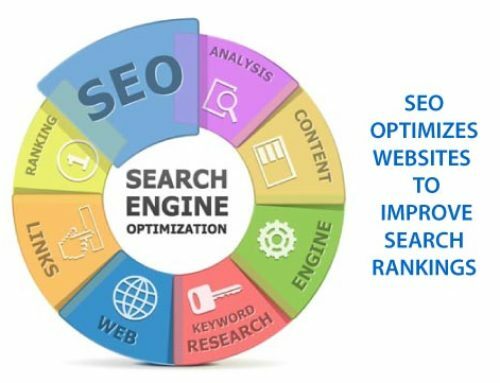 SEO helps to increase the quality and quantity of free or organic traffic that your website receives from the search engines. According to estimates, Google gets more than 70% of search traffic. Your website needs to rank well on Google search listings so that local customers can find you when they search online for your products and services. Your website must be optimized for on-page SEO optimization and include your city and location information. A great Title and Meta description. Make them compelling so they will invite clicks. For local customers, include your city name in the description. Use your keyword in Header H1 tags, titles, meta descriptions, URLs and image alt tags. Improve Internal links – link to related articles from every page. Optimize all website content for keyword and city name. Show NAP (Name, address, phone number) in footer. If your business has several locations, create separate local landing pages with local name, address, phone number (NAP) and hours for each location. Link signals are an important local SEO ranking factor for both the “local pack” as well as for “organic” rankings. Build up the internal links on your website. Link to related articles and content from every page. Get inbound links from trusted businesses in your local area. This builds trust and authority. Local businesses to get links from include local news sites, community blogs, local chambers of commerce, local business associations, local charities and local universities. Regularly publish local content on your website to improve local rankings. Having an active blog on your website is very beneficial for SEO. Content should be optimized with your keywords and location. Every new blog post gives you a chance to add new optimized content with keywords that are relevant to your products and services. Content could include blog posts with useful information, FAQ pages, local landing pages for each business location, local “best of” guides, information about local events and press releases. You can also guest-post for local blogs and publications that will send inbound links and targeted traffic back to your website. Reviews are an important factor for local SEO. Getting online customer reviews helps your local SEO rankings and builds trust and visibility. It is especially important to get positive reviews on Google and Facebook. The number of positive reviews on Google is a local SEO ranking signal. Ask your customers for reviews. When you get customer reviews, respond to them. Reviews with responses positively influences local SEO rankings. Structured data provides search engines with additional information about the content on your web page. It is a piece of code that is written in a specific format and added to the html markup of your web page. Structured data is highly recommended by Google. It can be used to show business name, address, hours, website, phone number, ratings and more. Using structured data also increases the chances for your content to be featured as rich snippets on Google search engine results. Structured data markup is coded using schema.org. Setting up structured data can be complicated. Your web developer can help you get it implemented correctly on your site. These local SEO methods will help you improve your local search rankings and attract local customers. You will soon be on your way into the “Google local pack” and improved local SEO rankings on Google, Bing and other search engines. Optimize your business listing on Google My Business with your business information and plenty of images. List on Bing Places for Business and other online directories with a consistent Name, Address and Phone number. Optimize your website for On-page SEO optimization. Ensure that your website is mobile-friendly, responsive and fast-loading. Get relevant and trustworthy inbound links from local businesses. Regularly post useful content and local information on your website and blog. Earn positive customer reviews online. Use structured data markup on your website. 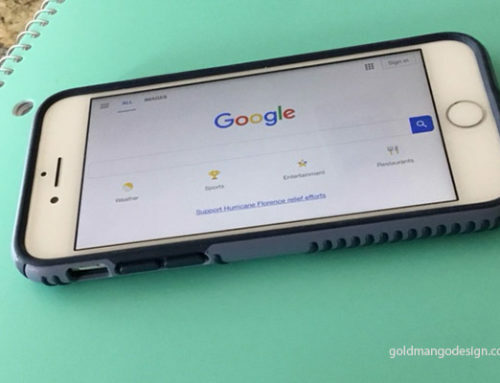 If you need any help with your website or SEO optimization contact us at https://goldmangodesign.com.